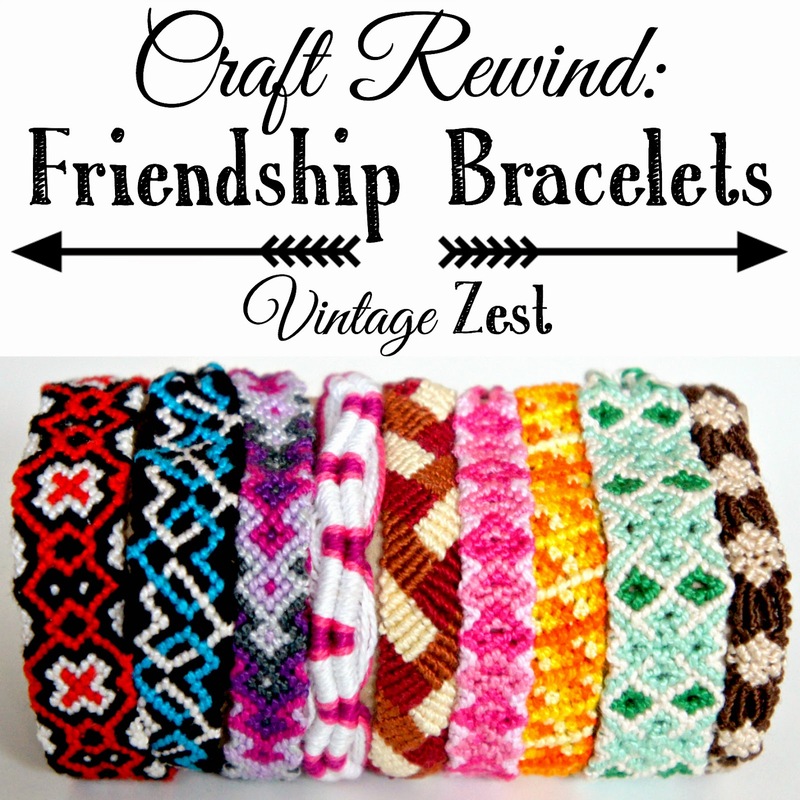 Craft Rewind: Friendship Bracelets ~ Diane's Vintage Zest! This is my last craft rewind post! At least until I find more boxes stuffed with old projects. :) I have shared all of my past sewing, crochet, knitting, cross-stitching, and lanyards, and I will end on friendship bracelets! I liked using a rainbow of colors, and it was really fun to make different patterns too. Now, let me point out a couple of special ones. To store it, I completely forgot about this, but I used two toilet paper rolls! I tried using fancy bracelet holders, but this was the easiest thing to be able to slide them on and off easily and still keep them neat. Pretty clever! 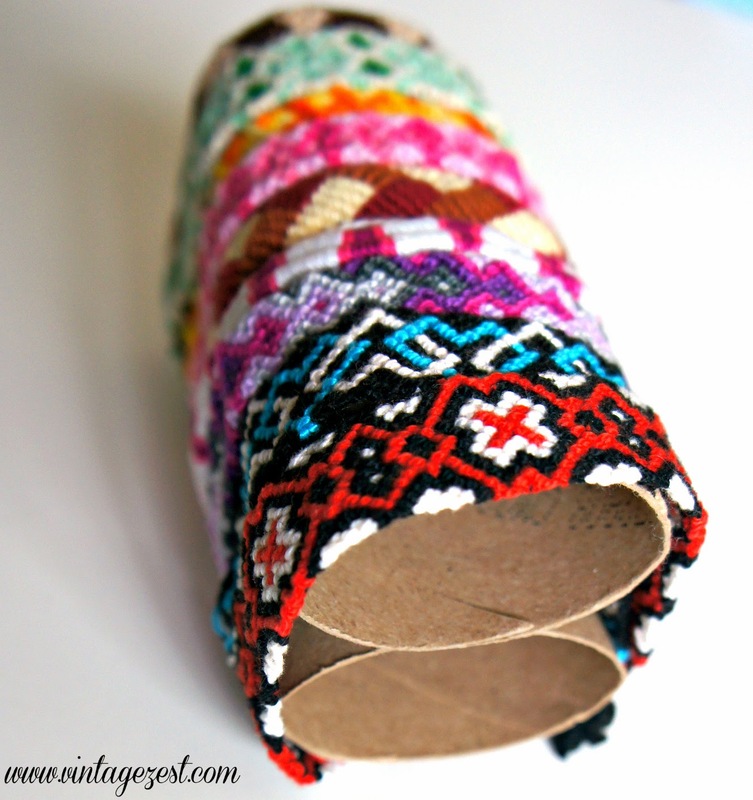 Did you ever make friendship bracelets? I just love friendship bracelets, and am currently wearing one, compliments of my daughter! Yes, I know: I scored big! I Diane. I love all of the colors. These are so fun. My daughter loves wearing these bracelets. She would get a kick out of making her own! Omgosh I remember making these when I was in elementary school...many many years ago :-) They've gotten a lot fancier since I've made them. Thanks for sharing on Merry Monday. They look beautiful but are they difficult to make? I have never made them but would love to try. I sell various patterns of friendship bracelets in my Etsy shop, Bracelets By Jen. I love making them. I started making friendship bracelets when I was in middle school when there was only a few patterns. Now there are hundreds of patterns. I love the patterns you picked. They came out nice. The chevron and candy strip are not very difficult. The advanced patterns are somewhat difficult if you are not familiar with the four basic knots. Plus they can be very time consuming as some of the more difficult patterns take me 6-8 hours to make. They are fun though once you get the hang of it.